Below is a generic press release that can be used by your GCU to contact the media about your decontamination event. Just modify the sections within the brackets [ ] with your GCU’s information. 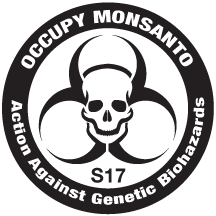 To view some examples, check out the earlier Occupy Monsanto Press Releases. 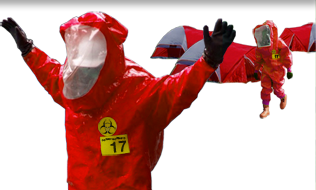 [YOUR CITY IN CAPITAL LETTERS, BOLDFACE TYPE] – On [DAY OF THE WEEK], September [17-24], 2012, Occupy Monsanto’s field agents with the Genetic Crimes Unit (GCU), a group whose aim is to expose Monsanto’s crimes against humanity, will wear bio-hazmat suits during the occupation of the Monsanto facility located at [Street Address]. The GCU opposes Monsanto’s bid to increase spraying of crops with toxic weed killers like 2,4 D (the main ingredient in Agent Orange) and dicambia, the continued genetic contamination of the organic food supply, and other risks associated with genetically modified organisms (GMOs). [INSERT QUOTE] “In the name of Wall Street profits, chemical corporations such as Monsanto genetically engineer crops to withstand high doses of their herbicides and pesticides that contaminate our food and water, and have not been proven safe. We deserve to know what we are eating. Europe, Japan, China, Australia, New Zealand, and other industrialized nations require the labeling of GMOs so that citizens can make informed choices. Other nations like Peru and France have even banned GMO crops. But thanks to companies like Monsanto, US consumers are denied the right to know if their food is GMO. ” said GCU’s [GCU ACTIVIST NAME/ALIAS]. “Monsanto pays Congress vast sums of money under the guise of lobbying efforts to keep GMO labels off their patented Frankenfood products. Our Congress is contaminated with GMOs and toxic chemicals, and the lack of rational, responsible labeling policy threatens our health and the health of the planet,” says [GCU ACTIVIST NAME/ALIAS]. Does your Genetic Crimes Unit need banners? Download the PDFs below, print them out, and inform the world of what is happening on the week of September 17th, 2012. To print a banner, click on the design you like & download it (right click on PC or command click on Mac and “Save as file”), and take this file to your local print shop to have a full-color, 3′ x 9′ vinyl banner made. It should cost less than $200. If you choose 4′ x 12′ it will cost around $400. Alternatively, you can use these designs to create your own hand-made signs. Most hardware stores have large canvas drop cloths that can be cut to size and hand-painted. 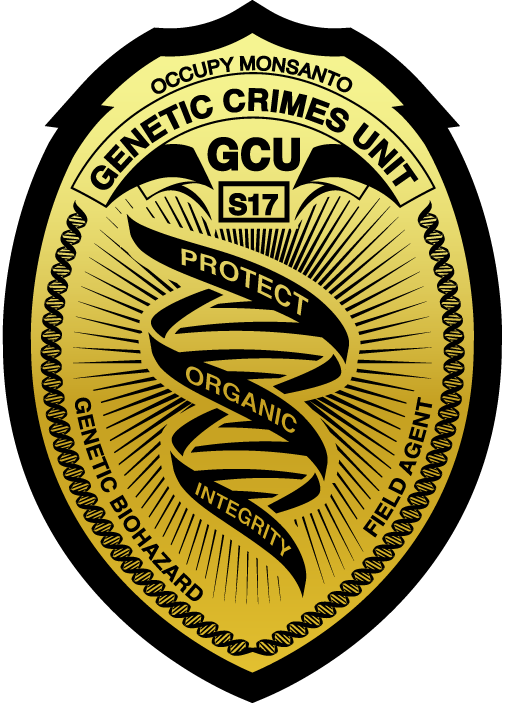 No Genetic Crimes Unit is complete without a Field Agent badge. For best results, download the PDF of the GCU Field Agent badge, print it out on 8.5in x 11in paper, cut the badges to size, then laminate. Your local print shop is likely to have a laminating machine — use a luggage tag laminating pouch combined with a shiny hologram or foil for added authenticity. If lamination is not available to you, bind your printed badge with a rigid piece of paper or index card and insert it in a ID/badge holder.